Novelist Anthony Horowitz officially re-opened the University of York's JB Morrell Library on June 16 following its three-year refurbishment. The University of York Library has completed a £20 million refurbishment to provide a world-class library for students, staff and researchers. The refurbished library offers a range of 21st-century technology and media-rich learning, teaching and research environments in proximity to specialist support and physical collections. The ground floor of the library is also home to the Library Cafe. Walls and ceilings were replaced, and the works included an asbestos removal programme. 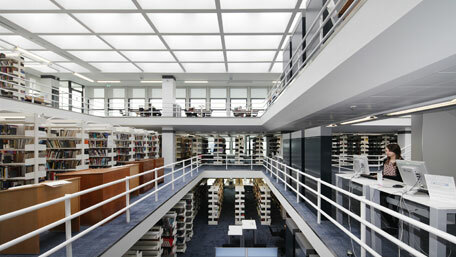 The building works, undertaken by Shepherd Construction, required complex logistical planning as the library continued to operate throughout the refurbishment. All areas are IT enabled with either fixed PCs or WiFi. More information about the library and the refurbishment programme.